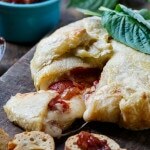 Baked Brie wrapped in puff pastry has to be one of the most impressive and elegant appetizers. And with the help of frozen puff pastry, it’s really not that difficult to make. 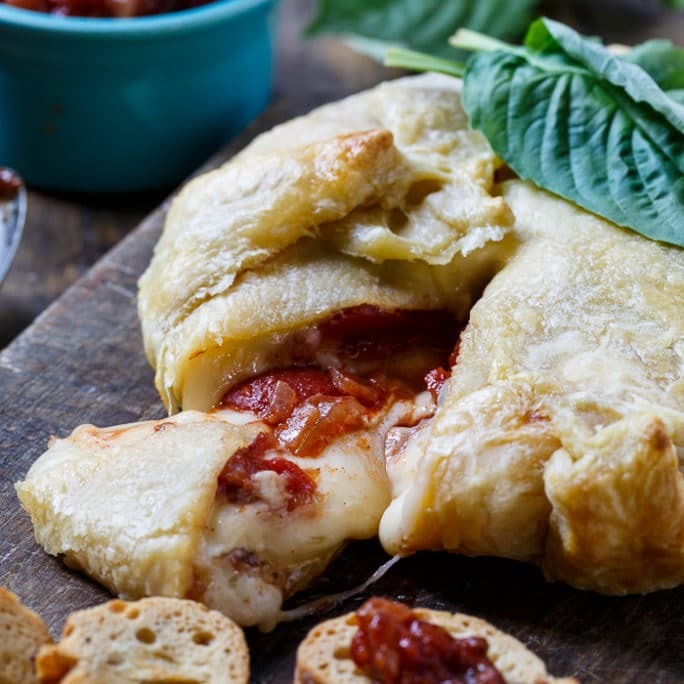 Today I’m sharing a beautiful and delicious Baked Brie with Tomato Chutney from Tuttorosso Tomatoes. This appetizer would be wonderful to serve for a Mother’s Day Brunch or any Spring party. 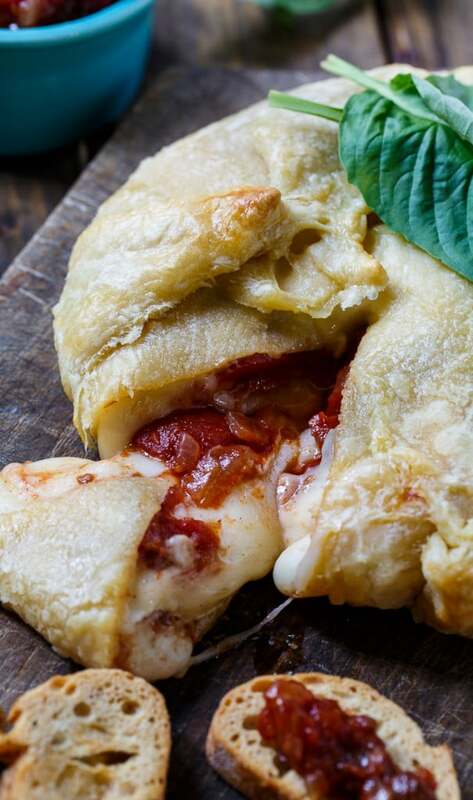 Warm melted Brie cheese wrapped in buttery and golden puff pastry is something most people have a hard time resisting. Add in the unique flavor of tomato chutney, full of warm spices and a wonderful tangy flavor, and you have a truly special appetizer that your guests will rave over. The base of the chutney is a can of Tuttorosso Peeled Plum Tomatoes with Basil Flavor. Tuttorosso has been my go to brand of tomatoes since they became available in the Carolinas. I find the quality and taste to be superior to other brands. See my taste test between Tuttorosso Tomatoes and Hunts. The tomatoes are simmered with sugar, onion, lemon zest, red wine vinegar, raisins or currants, mustard seeds, and a few spices until thick. The tomato chutney can be made a good 1-3 days in advance and refrigerated. I think the flavor actually improves over time. If you make the chutney in advance, the baked brie can be assembled in just a matter of minutes and then it only takes 25 minutes to bake. 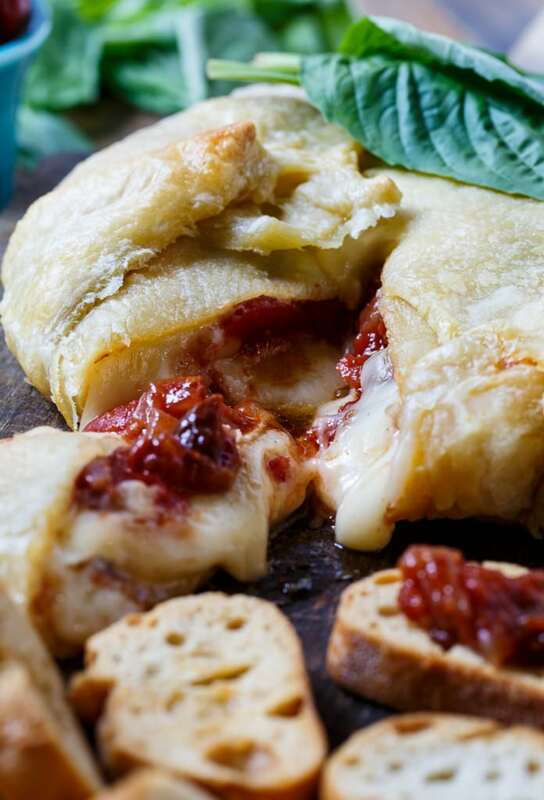 Warm melted Brie cheese wrapped in a buttery and golden puff pastry and topped with homemade tomato chutney. In a heavy saucepan combine all ingredients for chutney. Cook mixture over medium heat, stirring occasionally, for 30 minutes. Reduce heat to low and simmer mixture, stirring occasionally, for 30 minutes more, or until thickened and reduced to about 2 ½ cups. Refrigerate until ready to use. Cut off top rind of cheese and discard. Set brie in center of puff pastry. Place 1 to 1 1/2 cups tomato chutney on top of brie. 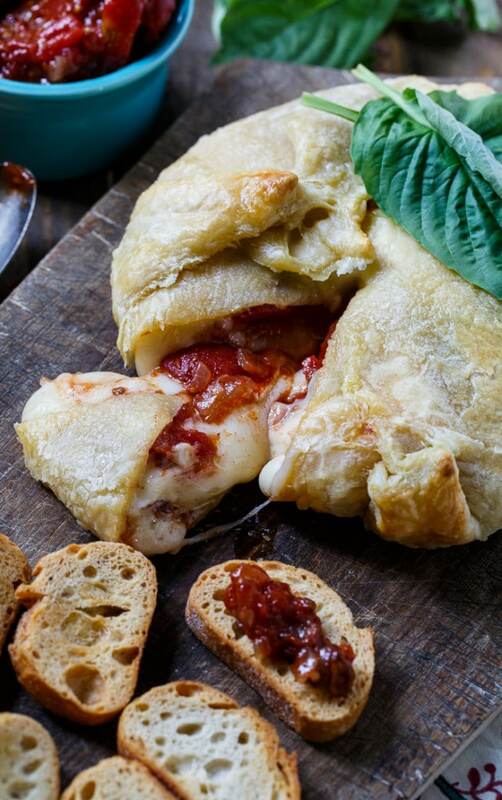 Fold the pastry dough up and over cheese and chutney, sealing edges with egg wash. If you have excess pastry dough, you can cut it off and shape it into decorative pieces to place on top. Brush entire puff pastry with egg wash. Place on baking sheet and bake 25 minutes. Let cool 20 minutes before serving with crackers and toasted baguette. Disclosure: This is a sponsored post. All opinions are mine and I love the opportunity to share the products I use in my own kitchen. This entry was posted in Appetizers and tagged brie, chutney, tomatoes. Bookmark the permalink. How decadent, brie wrapped in pastry. YUM. Can’t get enough of those meltingly delicious images too. 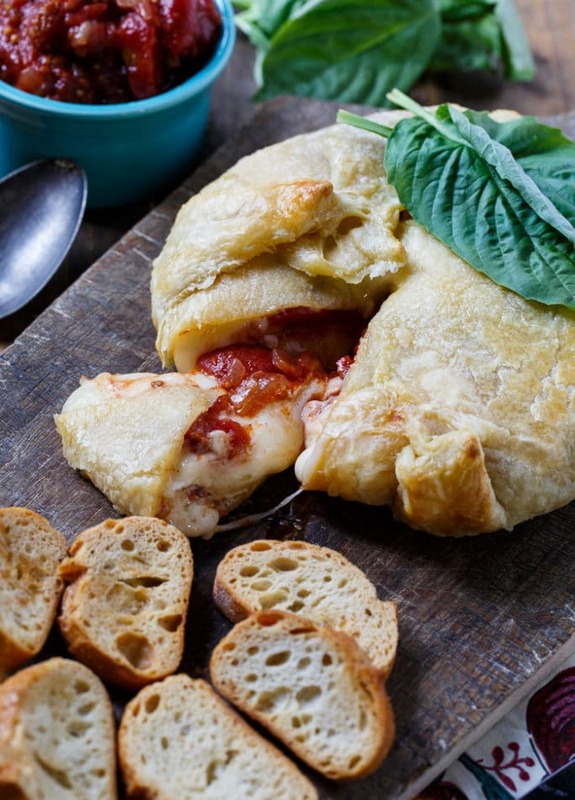 I agree, Puff pastry wrapped baked brie is impressive, yet easy to make which is great! Looooving yours! The tomato chutney looks and sounds like a delicious addition! I could eat just this for dinner and be one happy girl. 😉 Cheers, friend! This would make the most delicious appetizer! 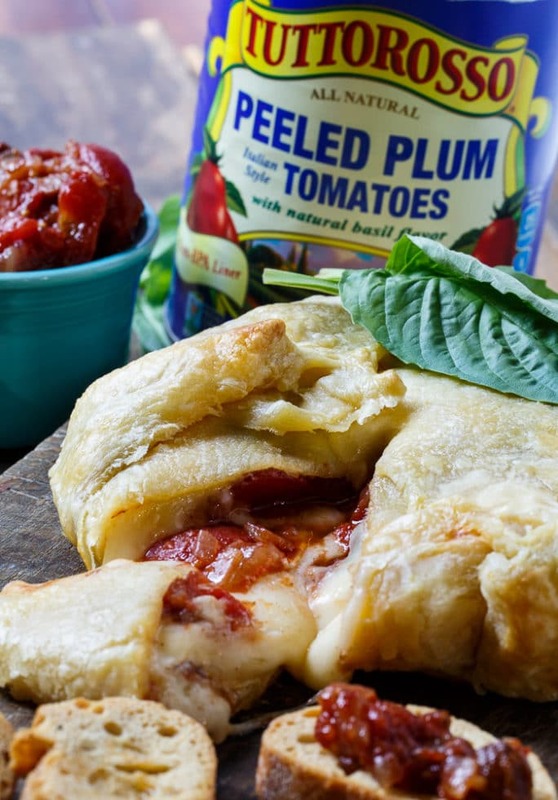 I love all that pastry, brie, and that tomato chutney sounds amazing!